Giulio Romano (1492-1546) was the strongest of Raphael’s pupils, and became the real founder of the Roman School, which directly influenced the painting of the Decadence. As long as he was under Raphael’s influence he painted so closely in his style that in many instances his work is almost like his master’s; but after Raphael’s death he struck out for himself, and in his hands the refined strength and power of Raphael be- came exaggerated coarseness. He was a good draughtsman, but his forms are heavy and entirely lack the grace of Raphael. His color was dead and of a bricky tone, due, it is said, to his having been employed so much by Raphael for the dead-coloring of his pictures. In his decorations at Mantua, the Fall of the Giants, in the Palazzo del T&, he oversteps all bounds of taste and artistic judgment. The walls are painted as a tumbling, chaotic mass of architecture, in the midst of which the bulky giants are being crushed. The decorations are entirely out of scale with the room, which is rather small. Thus the decadence of Italian art is already staring one in the face; for here the nice discrimination of fitness, of harmony, of restrained and ordered power is entirely lost. Francesco Penni (1488?-1528) was, next to Giulio Romano, Raphael’s most confidential assistant. He died only eight years after Raphael, and his works are rare; but he seems to have been content to closely follow Raphael’s style. 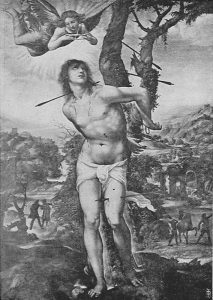 Francesco Primaticcio (1490-1570) was a pupil of Giulio Romano. He assisted Giulio in the Palazzo del Tfe, and was afterwards invited by Francis I. to France, where he had much to do with founding the school of Fontainebleau. Giovanni da Udine (1487-1564) was trained in the Venetian School before coming to Raphael. He was chiefly distinguished for painting the arabesques in the Loggie of the Vatican. The style of these was founded on the antique decorations in the Baths of Titus, then recently discovered, and formed a new school of ornamental art, the influence of which is still felt. Perino del Vaga (1500-1547) also did some decorative work in the Loggieof gTeat liveliness and interest. The little Cupids, for instance, holding wreaths, etc., are full of lively action and drawn with much vigor and grace. Andrea Sabbatini (i48o?-i545) was one of the chief instruments in bringing the principles of the Roman School to the south of Italy. Sabbatini’s color was good, but he fell into a mannered style in trying to follow Raphael. Several artists from the Bolognese School, and followers of Francia, entered into Raphael’s School. Innocenza da Imoli (1494-155°?). although he never resided in Rome, became such a zealous follower of Ra- phael that he often re- peats whole figures from Raphael’s pictures in his own compositions. Timoteodi Viti (1469- 1523) was born at Urbino and returned there after a short residence at Rome. His work has the grace of Raphael and a good deal of the Umbrian sentiment. His Magdalene in the Desert is a charming example of his work, and shows that he did not run into the excesses of the Roman School. The most prominent of Leonardo’s followers was Bernardino Luini (1475-1533) whose work is characterized by sweetness and purity of sentiment, a trait really distinguishing the whole school. His style resembles Leonardo’s to such an extent that several pictures which are now attributed to Luini were formerly thought to be Leonardo’s. The Herodias’ Daughter, in the Uffizi, for instance, is one of these. It has much of Leonardo’s charm and softness of light and shade and much of his grace, but it lacks the penetration of that master and his power to represent character. Luini’s frescoes rank him among the first fresco painters, for his technique in that medium was astonishingly free and bold. In the Brera Gallery are several fragments of his wall-paintings, and among them the Body of St. Catherine Borne to the Tomb is the finest. This is distinguished by a beautiful simplicity, purity and tenderness of spirit. 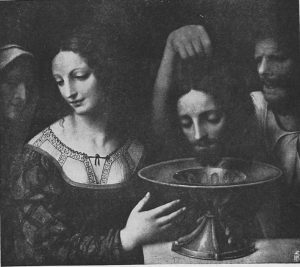 Marco da Ogglono (147o?-153o) was also a close follower of Leonardo, but he did not have the sweetness and deep charm of Luini. He made an excellent copy of Leonardo’s Last Supper. Andrea del Salaino (fl. 1495-1518) resembles him, but has more freedom and power. Beltraffio (1467-1516) is a painter of much gentle refinement and purity. Andrea Solario (1458?-1515?) shows by a portrait in the London Gallery a decided Flemish influence in the close following of line and modeling. But he came later under the influence of Leonardo at Milan. The Flemish carefulness still distinguished him, but his work became imbued with much feeling and tenderness. Carefully-wrought detail and smooth finish is also characteristic of him. Gaudenzio Ferrara (1481?-1547?) is distinguished by a peculiarly fantastic style of his own. He was an exceptionally brilliant colorist, but his work lacks tone. He used primaries almost entirely, and his color lacks unity. His frescoes are almost equal to Luini’s in freshness. He painted unevenly, and sentiment with him was sometimes carried too far, but in all he is considered one of the most interesting painters of northern Italy. The Siennese School, which had been so important in the Gothic period, had no artists of any prominence in the fifteenth century; but in the sixteenth century it saw a decided revival under the leadership of Sodoma (also variously called Razzi or Bazzi), (1477-1549), who settled in Sienna and built up a school there. He was a pupil of Leonardo da Vinci, and his earlier work was strongly influenced by him. He seems much better in single figures than in large compositions where many figures are introduced, for these are often crowded. The human figure he rendered with the greatest beauty of form and line and expression, and his best female heads are almost ranked with Leonardo’s. His St. Sebatian, in the Uffizi, shows a fineness of form almost classic in its perfection of modeling. In his Descent into Hades, now in the Museum of Sienna, the figure of Eve is so beautiful, so exquisite in line and proportion, with so much of Leonardo’s charm and feeling, that it is justly famous. The figure is part of a fresco in which medium Sodoma’s best works were done. Sodoma became a friend of Raphael, and later in life he was strongly influenced by him. The other men of the Siennese school were not of much strength, and the influence of the school in the sixteenth century was very slight. Baldassare Peruzzi (1481-1536) was one of the best of the modern architects, and he also holds considerable rank as a painter. He is especially known for his architectural ornamental painting. Dominico Beccafumi (1486-1551) assisted his master Sodoma, and at such times his work approaches the excellence of his master’s. He became more mechanical in later life. Pacchtarotta (1474-1540? ), who also assisted Sodoma in his frescoes, and Oirolamo della Pacchia (1477-1535) are other painters of this school.